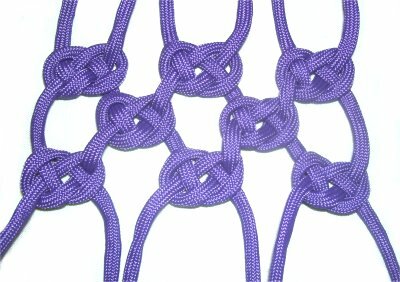 Description: The Sailors Knot is considered a variation of the Josephine knot. The difference is that you use two separate cords. There are also two loops, rather than three. 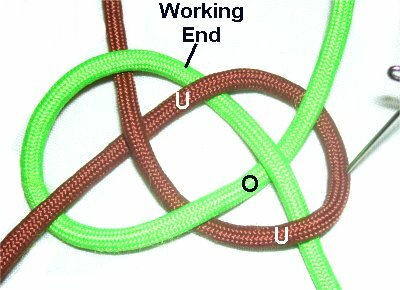 This decorative knot is a great technique to use when making jewelry projects, such as the Leather Bracelet. You can also use it to link 2 cords together, or as a mounting knot. 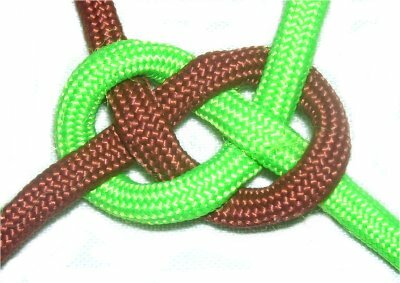 Below the main instructions are two other ways to use this knot; in a sennit (chain), and with an alternating design. Step 1: You need 2 cords to practice, each at least 36 inches long. Using two colors really helps while you are learning. Secure both cords to your board vertically. 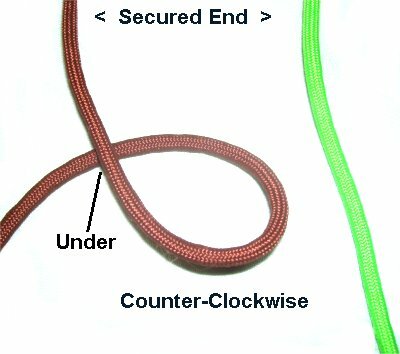 Make the first counter-clockwise loop with the cord on the left (brown). Make sure the working end passes under the secured end to make the crossing point. Step 2: Move the cord on the right (green) over the loop, and under the working end of the left cord. Bring it over the secured end (left cord), as you rotate it clockwise. Step 3: Weave the working end of the right cord through the loop made by the left cord, passing under - over - under the three segments. Step 4: Tighten the Sailors Knot by pulling on the ends. There are two types of patterns that can be tied with the Sailors knot. The first is a sennit, which is tying several knots in a vertical direction. 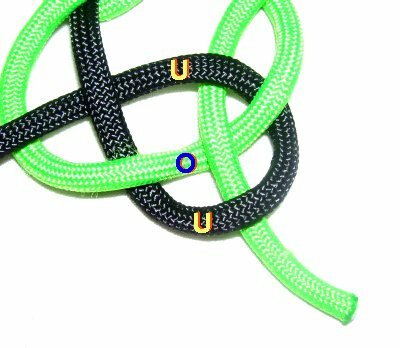 The knots can be close together, or be separated slightly. A design like this can be used as a bracelet, belt, or strap. 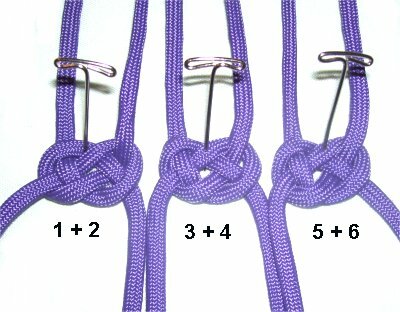 Step 1: Tie the first Sailors Knot following the instructions above, close to one end of the cords. Secure it to your board. The working cords will be the long ends at the bottom. 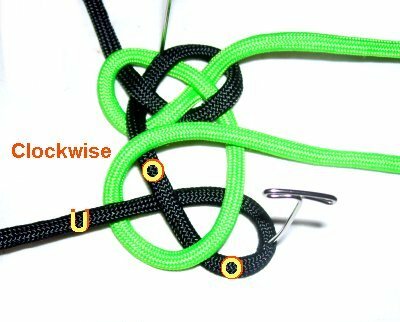 Make a counter-clockwise loop with the working cord on the left (black). Make sure the end goes under to make the crossing point. Step 2: Bring the working cord on the right (green), over the loop. Pass it under the working end of the left cord. Pass it over the segment of the left cord coming from the knot above. 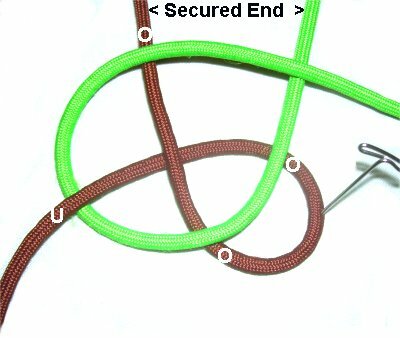 Step 3: Weave the right end through the three segments of the loop, under - over - under. Pull on the two loops first, to tighten the area above the knot. Pull on the ends to tighten the loops. Step 4: Repeat steps 1 - 3 to make the remaining knots in the sennit. 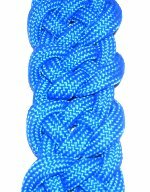 The other way the Sailors Knot can be used is in an alternating pattern, similar to Alternating Square Knots. Start by securing 3 folded cords to your board, so you have 6 cords to work with. Step 1: Mentally number the cords from left to right. 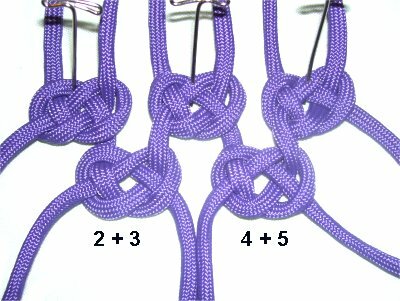 Make the first row of knots using cords 1 - 2, 3 - 4, and 5 - 6. Tie them as you did in the first set instructions, near the top of the page. Step 2: For the second row, alternate the cords. 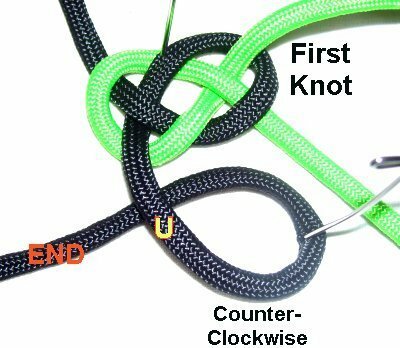 The first knot is tied with cords 2 - 3. The following one is tied with cords 4 - 5. Tie them as you did in the second set of instructions (the sennit). Design Tip: In the images shown, space was left between the rows to help you see the details. You can either mimic this arrangement when you practice, or place the rows close together. Step 5: Repeat step 2 to make additional rows, alternating the cords each time. Have any comments about the Sailors Knot? Contact Me.